A hole in a protein lets ions leak into cells, thereby triggering the profound muscle weakness of hypokalemic periodic paralysis. The voltage sensor has two cavities (purple) that do not connect. 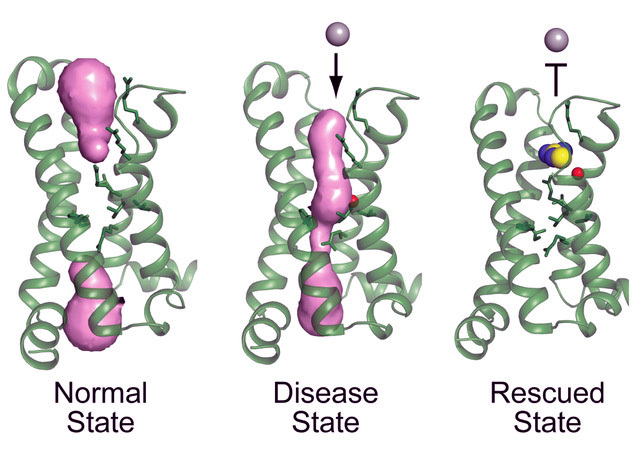 Mutations (red) linked to periodic paralysis allow them to join, creating a pore through which ions can leak. Compounds (blue and yellow) that block the pore could treat the condition. A rare genetic disorder in which people are overcome suddenly with profound muscle weakness is caused by a hole in a membrane protein that allows sodium ions to leak across cell membranes, researchers at the University of Washington School of Medicine in Seattle have found. The condition is called hypokalemic periodic paralysis. People who have this disorder also occasionally have low blood levels of potassium, a state called hypokalemia. The disease was known to stem from mutations that alter certain cell membrane proteins, but how the mutation changes the proteins’ function was not known. “Our results reveal the mechanisms of periodic paralysis at the atomic level and suggest designs for drugs that may prevent this ion leak and provide relief to these patients,” said William A. Catterall, a professor of pharmacology at the UW School of Medicine who led the research. The researchers report their findings in the journal Nature. Daohua Jiang and Tamer Gamal El-Din, postdoctoral researchers in the Catterall lab, are the lead authors. Ning Zheng, a professor of pharmacology and investigator of the Howard Hughes Medical Institute, is the co-senior author of "Structural basis for gating pore current in periodic paralysis." In their resting state, muscle cells maintain a charge difference, or voltage, across their cell membranes. This voltage is created by differences in the concentrations of sodium and potassium ions inside and outside the cell. This difference is maintained by a system of ion pumps that move ions in and out of the cell. Of these, the sodium-potassium pumps, which move sodium out of the cell in exchange for potassium, are especially important. Because of this system, the concentration of potassium is higher inside the cell while the concentration of sodium is higher outside of the cell. The interior of the cell is more negatively charged than the exterior because potassium continuously flows out of the cell. This charge difference generates a voltage across the membrane of about - 90 millivolts in skeletal muscle. This transmembrane voltage, called the cell’s resting potential, serves as a battery that drives the molecular machines imbedded in the membrane. This generates electrical signals, which initiate muscle contraction. In this process, chemical signals from a nerve cause chemically sensitive ion channels to open. Sodium ions then flow into the cell and lower the voltage difference across the nearby membrane. This change in voltage, in turn, is sensed by nearby voltage-gated sodium channels. If the voltage change is large enough, sodium channels are triggered to open. More sodium flows into the cell. This process creates a change in the membrane potential that ripples down the length of the muscle cell. The “action potential” that is generated triggers muscle contraction. The mutation that causes hypokalemic periodic paralysis affects a key functional part of the voltage-gated sodium channel, called the voltage sensor. It detects and responds to changes in membrane voltage by changing its molecular shape. The reconfiguration causes the channel to open and permits sodium ions to pass into the cell. In their study, the researchers used a technique called X-ray crystallography to determine the structure of the normal and mutated versions of the voltage sensor at atomic resolution. They found that mutations responsible for hypokalemic periodic paralysis create a small hole through the center of the voltage sensor in the sodium channel protein. Sodium ions can continuously leak through this opening. “This leak causes sustained membrane depolarization and action potential failure, thereby paralyzing the muscle,” Catterall said. Under ordinary circumstances, the ion channels that allow potassium to flow out of cells and the sodium-potassium ion pumps are able to make up for this leakage, the researchers said. But when extracellular potassium concentrations fall below normal, the condition called hypokalemia, the cells can no longer compensate. This explains why individuals with this condition experience muscle weakness and paralysis when their blood potassium concentration falls, Catterall said. The researchers also showed that compounds containing a chemical group called guanidinium can block the pore created by the mutation and stop the sodium leak without altering the voltage sensor’s ability to function. “Our high-resolution structural models may provide templates for drugs that mimic the effect of guanidinium, block the gating pore current, and could perhaps prevent or treat periodic paralysis,” Catterall said. This research was supported by National Institutes of Health research grants (R01 NS015751, R01 HL112808), the Howard Hughes Medical Institute, and the Canadian Institutes of Health Research (MOP 130461).